Greetings friends! We’ve just returned from a few weeks away, and I wanted to pop in before week’s end with a creation for this month’s Power & Spark Challenge, Inspired by Home. I think it’s a fun idea to look around you at what you already have, what speaks of home to you, and create from that inspiration. 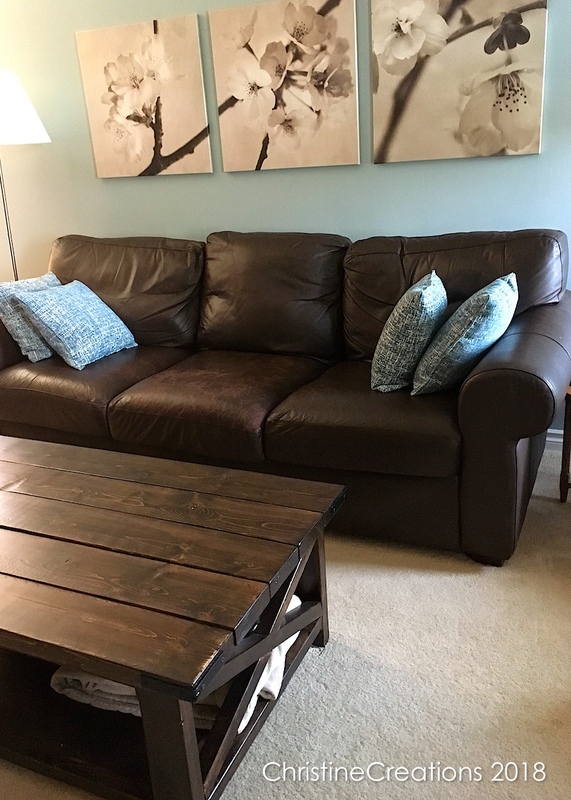 We’ve spent a lot of time doing different projects around our home this spring and summer that have freshened it up and made it more inspiring and comfortable for us all. So for this creation I chose to be inspired by our newly painted living room, and a new coffee table my husband made for us. He did such a beautiful job with it. So this is the lovely rustic table made by my husband. I love the deep stain, the criss cross pattern on the side (you can see a cozy blanket tucked in there). We have our old and comfy leather couch, some new pillows I sewed, and then the triptych canvases from Ikea of some pretty cherry blossoms. 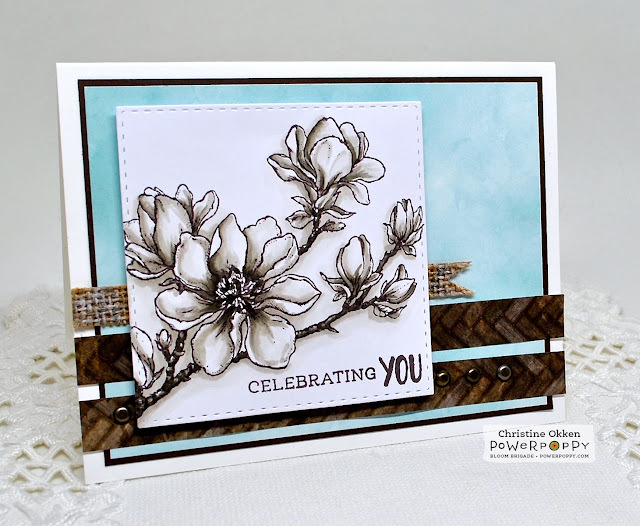 In my card I utilized the beautiful Planning for Magnolias stamp set because it has a similar feel to the branches on the canvases. I also used those same sepia tones with some W00, 02, 03, 05, 07 Copics. To mimic the criss-cross on the table and wood planking I used some strips of deep brown designer paper that has a brick or chevron pattern in it. Taking my cues from the texture of my pillows, I added the burlap and inked it a little with some Early Espresso ink (SU) and some white craft ink. Fresh and simple, and a wee bit rustic/beachy which is what our room looks like. 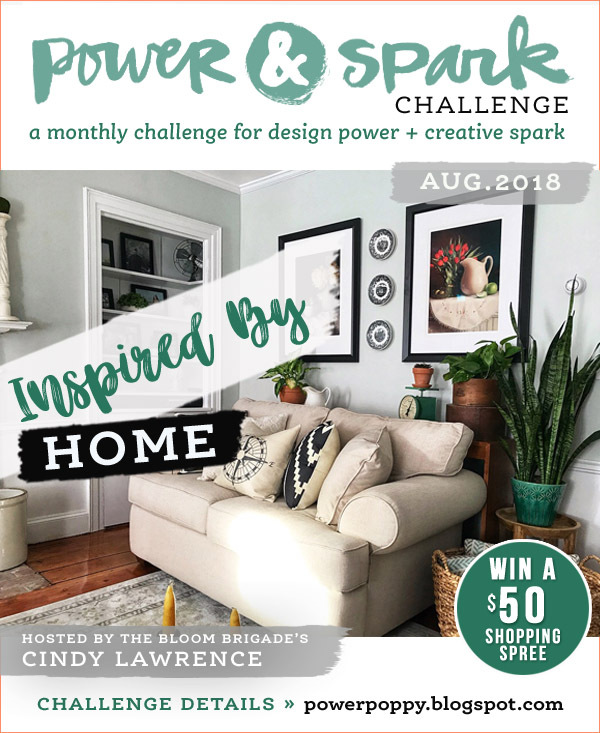 So, we hope you join us in the Inspired By Home challenge too! Pick anything from your home to be inspired by, and then be sure to show us a picture of what you’re taking your cues from, and your creation! 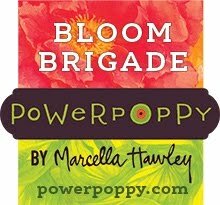 You could win a $50 Shopping Spree to the Power Poppy Store! Amazing how beautifully this card mimics your living room scene! And what a truly gorgeous card it is. I love every detail in the design and colors. Your living room is just my style -- comfy. Love the shade of blue you chose for the walls. Gorgeous! Love the colours, layout and such a great take on your living room. Love the coffee table, the room looks nice and cozy. Wow that is just amazing how you tied in together all the colors and textures from your room, love the colors you used in the flowers, Beautiful! Christine, what a gorgeous card! I agree with Leslie that it mimics your living room so beautiful with wonderful details! And, wow! Your husband made a fabulous table! He's quite the carpenter, and your room looks absolutely comfy. 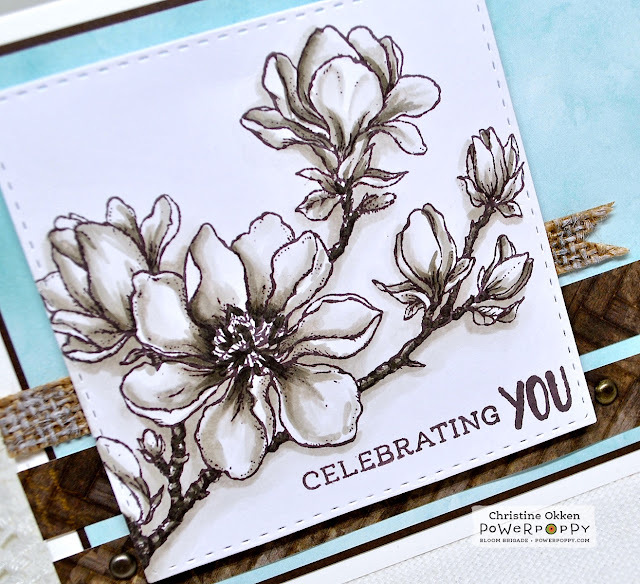 I love the beautiful shading in your magnolia, and it seems to pop off your card. Stunning way to use it, and I love it! Hugs!